Making the Kiln | Harray Potter Ltd. Using the limited evidence from these sites, a circular, turf-walled kiln was built in May 2007. This structure was 1m in internal diameter at the base and 1m in height, with walls 0.6m wide at the base tapering to 0.3m at the top. The upper layers of turf were slightly corbelled, giving the firing chamber an internal diameter of about 0.8m at the top. The turves, cut in square or rectangular blocks (around 0.3 x 0.3m and 0.6 x 0.3m) to an approximate standard thickness of 0.15m, were dug from a loamy soil, and loosely laid in a version of English bond. 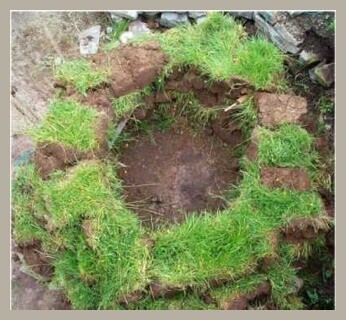 Approximately 20 square metres of turf was used to construct the kiln. Rough flagstone blocks were occasionally added to the wall circuit to give added strength and stability and to level up individual courses of turf. The kiln was built in four hours by two people. How to fire the pottery – surface bonfire, pit or kiln – has been debated long and hard by Project members. As is well known, no Neolithic pottery kiln has so far been unequivocally recognised in the British archaeological record. However, a structure found during excavations in 2006 at the Knowes of Trotty (Harray, Orkney) has been interpreted by its excavators as a probable pottery kiln of Neolithic date. Two other possible kilns, of the same age, were excavated in the 1980s at Allt Chrisal, on the Outer Hebridean island of Barra. All these features appear to have had turf superstructures.